This course is progressed through a series of systematic teaching materials and specially designed activities. Students can learn Spanish from beginning level to higher intermediate level. During class discussion, students are encouraged to express their opinions on business and social situations. Their vocabulary and colloquial Spanish will be greatly enriched upon completion of the course. These courses are designed for students who have completed the beginners' course or already have a basic knowledge of Spanish. The main emphasis will be on oral expression and short conversations. The main emphasis of these courses will be on vocaulary, sentence structures and irregular conjugation of verbs. Students will also be introduced with some colloquial expressions. The courses include newspaper reading, introduction to street slangs and simple passages from novels. Students will have a good knowledge of colloquial Spanish by the completion of the courses. The course intends to further improve students’ spoken Spanish. The students are encouraged to express their opinions on business and social situations during class discussions, so their vocabulary will be greatly enriched on the completion of the course. 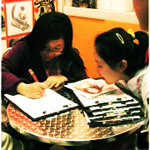 Our Association provides overseas study services in all languages and in all areas of design and studies. We have links with many European and worldwide countries’ university to help students to find suitable universities and learning areas. Give counseling and information on future career options and how to get there. Guide students with professional applications to overseas institutions. Assist with arrangement of accommodation, airport transfer, and/or airport pickup. Briefing of students (Help the students settle down successfully). Arrange home stay and transportation from the airport Provide overseas school reference list.